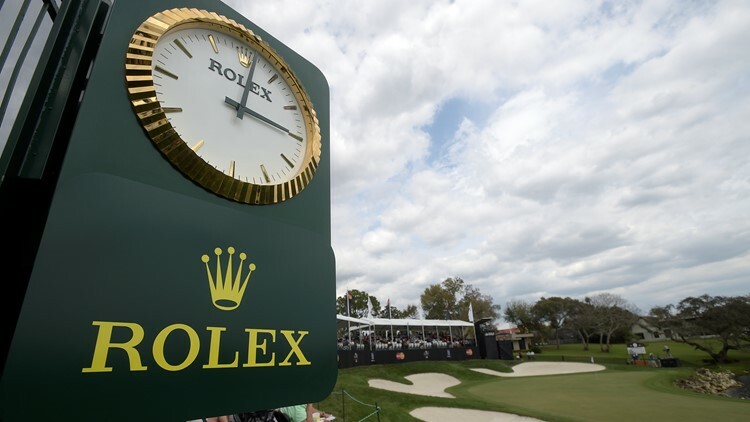 A time clock stands at the 18th green during the second round of the Arnold Palmer Invitational golf tournament on Friday, March 18, 2016, in Orlando, Florida. A USA TODAY sports columnist suggested golf should add a shot clock. Some “hot takes” are so stupid, you wonder if the person speaking their opinion actually believes it. USA TODAY Sports columnist Christine Brennan suggested golf should implement a shot clock as part of the publication’s Things We’d Change in Sports series. Her main argument was that the D-Day invasion of Normandy during World War II took less planning than golfers do to prepare for a shot. It is an absurd comparison. Brennan wrote she would be in favor of adding a 30 to 40-second shot clock, which would start when a golfer arrives at his or her ball. If the golfer didn’t get the shot off on time, he or she would have a one-stroke penalty. Imagine a Masters Tournament being decided based on a shot-clock penalty. Brennan compared it to a play clock in football or shot clock in basketball, claiming it’s exactly what golf needs with waning television ratings. Here’s an idea: If you don’t like the pacing of golf, don’t watch the sport. Golf has managed to exist since the 15th century. Major League Baseball briefly considered adding a pitch clock for the upcoming regular season before deciding to table the idea. The league could reconsider in the near future with the current collective bargaining agreement ending after the 2021 season. The beauty of golf and baseball is there is no time limit. If the sports’ organizers seriously consider adding shot clocks, they are trying to appeal to people who aren’t going to watch on television either way. Brennan mentioned the spike Tiger Woods brings to TV ratings when he plays. She’s right when she says Woods won’t be around forever. However, the NBA is dealing with the same issues with LeBron James moving to the West Coast to play for the Los Angeles Lakers. Playing 41 regular season games in the Pacific Time Zone, not as many people in other parts of the country can stay up late to watch the most popular basketball player since Michael Jordan. If not as many people are watching, the league can’t charge advertisers as much for commercials and advertisements. Mark my words, the television ratings for this year’s NBA playoffs will be the lowest they’ve been in years. Both the NBA and PGA each have one extremely marketable player, not a league that people tune in to consistently watch. The data shows that. It’s an issue networks must consider, especially with the increasing costs to broadcast live sports. Implementing a shot clock and changing the way a sport has been played for decades would not solve this problem. A solution for professional sports leagues to appeal to their core fanbases and to further generate casual fan interest would be to get on the forefront of sports gambling as more states decide to legalize it. The U.S. Supreme Court ruled in May 2018 that each state can decide whether to allow people to bet on sports. Nevada, Delaware, New Jersey, Mississippi, West Virginia, New Mexico, Pennsylvania and Rhode Island now have legalized sports gambling. New York and Arkansas have recently passed legislation to legalize it. Dozens of other states have also introduced legislation on it. Commissioners of the major American sports leagues would be wise to partner with a sports book or casino to allow fans to bet directly from their devices. A second-screen experience with a financial stake would help fans become much more invested in the outcomes of games. Plus, the leagues could make a small commission off each transaction. Creating a simple way for fans to wager on sports would help leagues sustain themselves from a business standpoint. Some viewers would watch actively to see the results in real-time, while others would make their bets and find out the results when it’s convenient for them. Many fans are already making their bets using offshore accounts. It’s time the leagues got a slice of the pie. Figuring out how to effectively integrate gambling – an excellent indicator of likely outcomes – into the mainstream would be an innovative approach, even if it takes more planning than D-Day. Mark Bergin is a journalist with 10News WTSP. Like him on Facebook and follow him on Twitter and Instagram. You can also email him at mbergin@wtsp.com.